Blizzard has confessed that making games for console would be much easier, but the World of Warcraft maker insists that it will continue to back the platform. PC gaming is apparently responsible for twice as many hardware shipments as consoles, but developers have often baulked at trying to code for an ever-shifting platform of hardware. 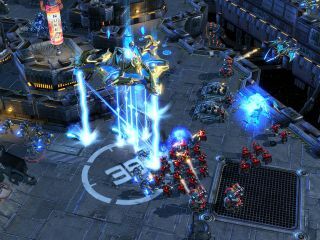 With Starcraft 2 immediately becoming the year's biggest selling PC title, along with the licence to print money that is WoW. Blizzard remains one of the most significant video games makers on the planet. So it won't surprise anyone that the developer is backing PC gaming, although VP and managing director of international operations at Blizzard Mike Ryder did admit that it wasn't always plain sailing. "[PC Gaming] is certainly not written off by us," Ryder told PCR. "PC development has a number of unique challenges that console developers don't face, but Blizzard is one of the few companies that is there making great PC games. "We've spent a lot of time in development focusing on scalability, on new PC hardware and old. "If you were just designing for a console it would be a much easier task." Just try saying that when you try to code a decent inventory system for a console controller, Mr Ryder.